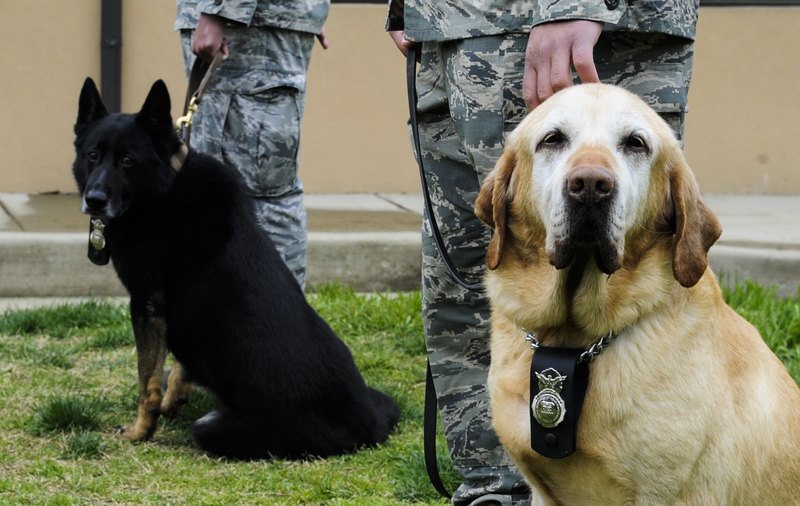 Military working dogs, Guero (right) and Besy (left), sit with handlers during their retirement ceremony. With a combined 31,000 hours of searches to their credit, three military working dogs retired May 1 at Joint Base Andrews in Maryland. Sam, Guero and Besy served approximately seven years each under the care of their handlers at the 11th Security Support Squadron, with the exception of Besy, whose career started at Joint Base Anacostia-Bolling in Washington, D.C.
“With a sense of smell 20 times more powerful than a human’s, MWDs are a vital asset to Air Force operations and are considered essential for detection of explosives, narcotics and can be used as attack dogs when necessary,” Tech. Sgt. Manuel Garcia, 11th Security Support Squadron military working dog section training supervisor, said in an Andrews news release. Combined, the three dogs cleared approximately 297,000 vehicles. Their detection capabilities served more than 180 foreign heads of state and dignitaries visiting the National Capital Region, and supported more than 100 missions for the State Department and Secret Service. During their retirement ceremony, all three dogs were awarded the Meritorious Service Medal. 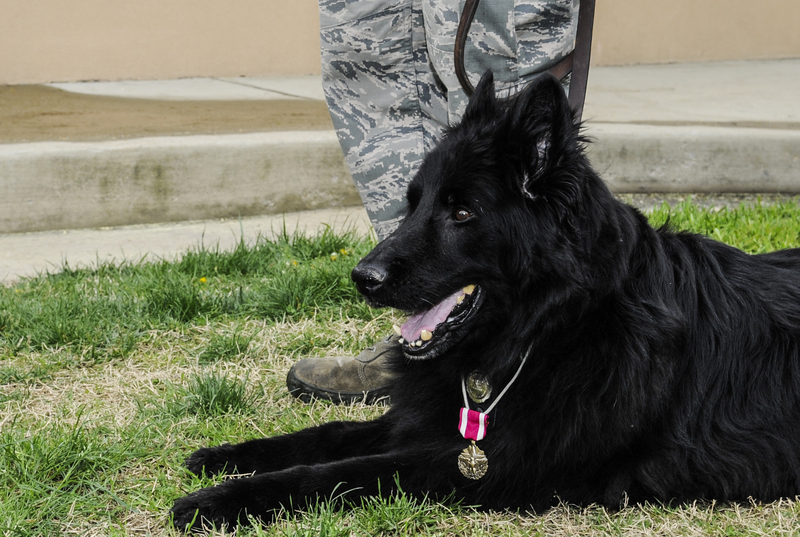 Sam, military working dog, wears his Meritorious Service Medal. The dogs went home with new families under the Military Working Dog Adoption program, which allows adoption of retiring dogs to law enforcement agencies, former handlers, and other persons capable of caring for the dogs.